Flavored malt beverages, or malternatives, are enjoying a resurgence. For someone old enough to remember the debut in the early 90’s of the widely ridiculed Zima, which these malternative trace their roots back to, it is perplexing to see these products still having such strong legs in the market place. The Budweiser brand recently scored a hit with Lime-a-rita, a few years ago, following that up with various on that theme with stuff like Straw-ber-rita, Raz-ber-rita, and even Water-melon-Rita. Never mind these concoctions taste straight out of a chemistry lab. Another recent malternative success story is Not Your Father’s Root Beer. Having tasting it at a beer festival last year, I’d have to agree. My father’s a man of good taste and I can’t imagine him drinking such a sickeningly sweet monstrosity. Given all the malt beverages I’ve tried tasted highly artificial, it seemed worth trying some samples of Hard Frescos a try. I started with the Cola Buena and unfortunately, my initial reaction was mixed. The fresh Kola seed flavors were nearly drowned out by all the sugar. My wife couldn’t drink her sample without cutting it down with some sparkling water. The Hard Frescos representative who sent the samples recommended mixing Cola Buena with Bourbon, bitters and a orange twist. I think you’d have to mix this with something to cut down all that sweetness. Next up was the Tangy Tamarindo and things got better. It was indeed, nice and tangy, and while sweeter than I would have preferred, it was definitely bearable. 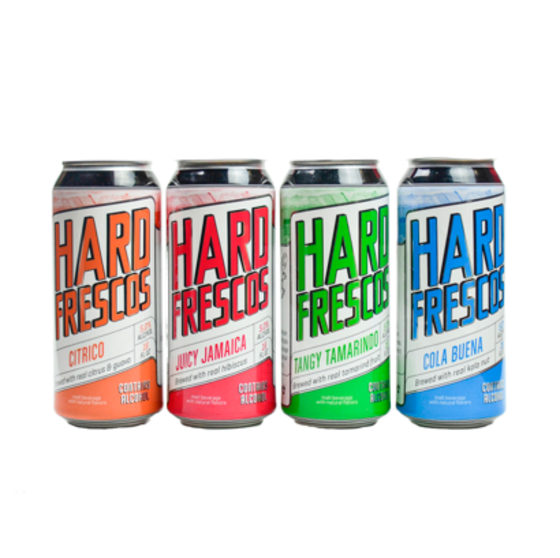 Hard Fresco’s suggests mixing Tangy Tamarind with an IPA, and I could see the tangy flavors really amping up an IPA. Citrico was a subdued, complex fruity combination with a bitter finish and yes, rather sweet. As for Juicy Jamica, my wife and I slowly sipped some from our wineglasses one late evening. Can’t really remember exactly how it tasted, but we were sort of lost in a nice moment to end a long day. So you have to say the flavors of Juicy Jamaica made that happen. I’d have to say Hard Frescos stand out in their field of mostly barely drinkable concoctions. They also seem partially geared as mixers for cocktails. Cocktails aren’t my thing, so I can’t really say too much about that, except to say all four of them contained fresh, vibrant flavors that I think would work in a mixed drink. In some cases, it was hard to get past all their sweetness. Given how artificial and soulless malternatives can be, it’s encouraging to see Hard Frescos taking them in a different direction.